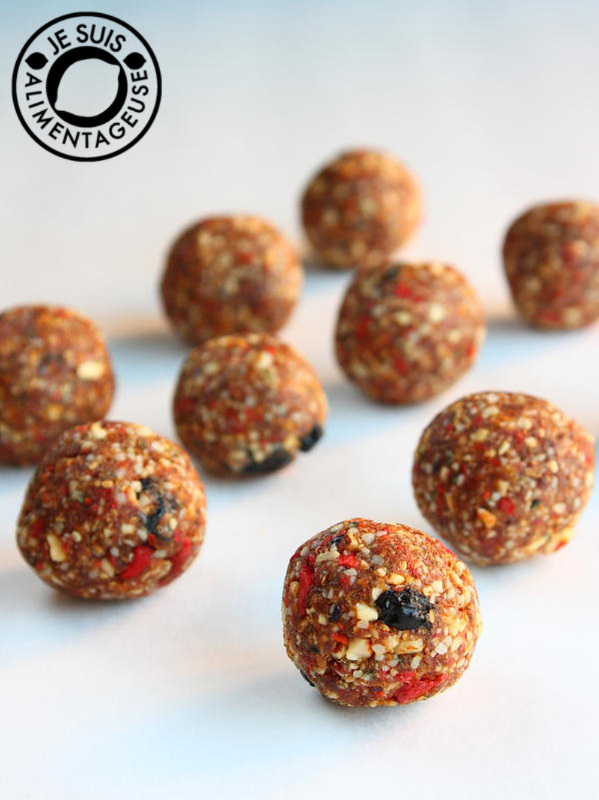 Goji date energy bites for a nutrition-dense snack. Do you ever have those days where you just, don’t feel right? You just can’t put your finger on it, but you know that’s simply how you feel? Maybe it’s just me but I’m having one of those days. Maybe it’s the paper-writing blues. Or maybe it’s the fact that I can’t go into the kitchen and bake something without feeling that I should be focusing on my paper. Or that despite the riveting nature of my paper (I actually am VERY interested in the subject) I just can’t bring myself to go and do it? I catch myself sitting alone in my room just thinking. Thinking about everything. Anything. And it makes me realize that I’m very happy when I’m alone. Not forever, I mean, I am happy just being by myself. I can watch all of my TV shows without being judged. I can read whatever books I want. I can noodle around on my piano when nobody is home and nobody is going to silently judge my lack of playing skills ever since I stopped taking lessons (I stopped when I moved to go to university). I can eat as much or as little as I want. I don’t have anyone telling me that I should be doing this or should be doing that. Or that they need to do this so they need me to do that. I’m not saying that I hate it when they do. It just feels nice to not do anything for anybody but me. This just leads me back to my introverted/extroverted debate I had with myself/my friends on Facebook not too long ago. How our world is built for extroverts and how only extroverts can excel. How school systems have been leaning towards the extroverted personality. It’s true isn’t it? They look for outgoing, vibrant students who show confidence and leadership skills. They encourage group settings, and they notice who takes charge. Those who went to school with me often see me as an extrovert. I am one to take the reigns of a project because that’s just who I am and how I do things. I have standards for myself and my projects and I would like to see them through. The same applies for any place that I’ve worked as well. I’m always ascending to leadership, to take charge. To change what I think needs to be changed. So I tried to think about whether or not I was an introvert or an extrovert. Obviously I cannot be one extreme or another, nobody should. You need a balance of both. But I tried to look at my life and think, am I more introverted? Or extroverted? I took an internet survey with fairly obvious questions to see what the internet thought I was. Even the transparency of the questions didn’t change my confusion. It put me right smack in the middle of the introvert/extrovert spectrum. One of my friends wisely said: I can definitely see you being smack dab in the middle, but where do you get your energy? And it’s a good question. Do I feel more energized, awake, inspired by myself? Or with other people around me? It’s given me a lot to think about, and I may address this question later on. But tell me, where do YOU think you fall in the introvert/extrovert spectrum? Use your food processor to blitz the almonds, goji berries, and blueberries until uniform in size. It'll almost be like almond flour, but not quite. I like bigger chunks, but keep blitzing if you don't. Remove the almond mixture and move to a large mixing bowl. Now process the dates until you get one purÃ©ed clump. Remove and add to the large mixing bowl. 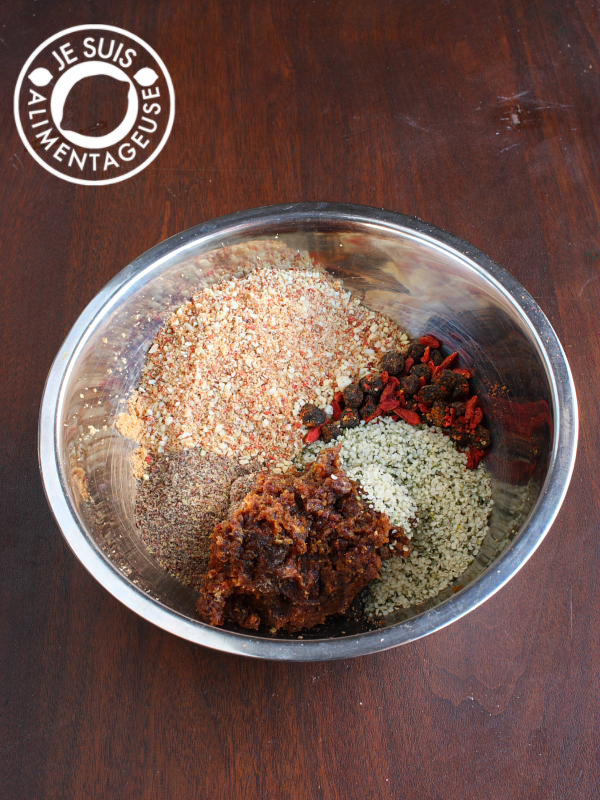 Add hemp hearts and flax meal, and start mixing everything together by hand. Things should clump all together, but in the case they aren't, add a little agave nectar (or raw honey) to get stuff to clump together. You can either roll the mixture into one-inch balls, or press the mixture into a pan and cut later into bars. The balls will dry a bit on the outside and shouldn't be too tacky. Store in an airtight container in the fridge. Keeps for about a week. To make it nut-free, use pumpkin seeds, sunflower seeds, or soy nuts in place of the almonds. To keep it vegan, use the agave nectar instead of the raw honey. Feel free to replace the goji berries and blueberries for some other freeze-dried fruit you like. Just be sure to blitz them in the food processor. I used dried berries but they didn't get processed very well, so I would recommend using freeze-dried blueberries if you can. These were simple to make and a great snack to have in the fridge for hunger pangs or a sweet treat. Two are a perfect pick me up before training. Can we use fresh berries if we don't have freeze dried on hand?